What is the Nutrient Value of Wheat Straw? Wheat harvest is now underway. What is the nutrient value of the straw? The nutrient value of wheat straw is influenced by several factors including weather, variety, and cultural practices. Thus, the most accurate values require sending a sample of the straw to an analytical laboratory. However, “book values” can be used to estimate the nutrient values of wheat straw. 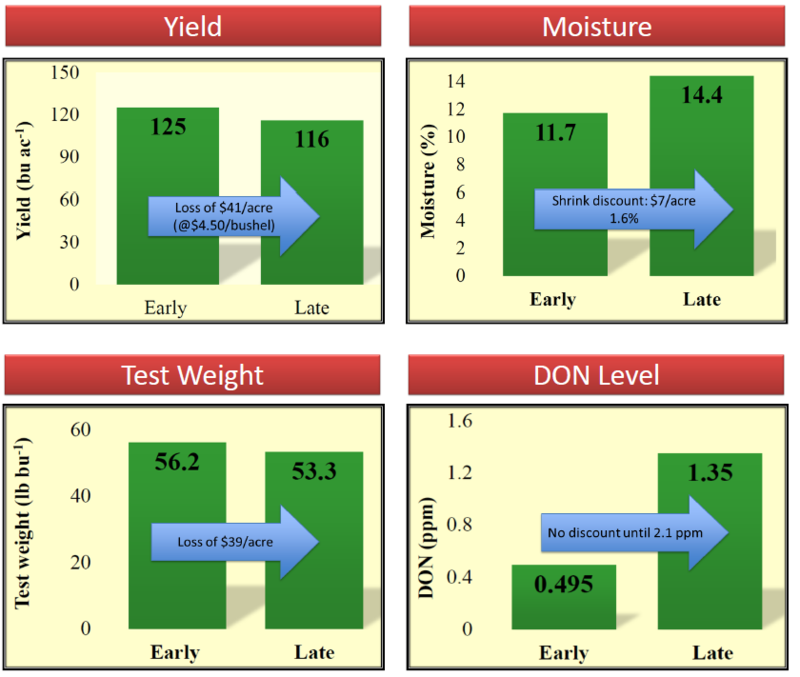 Wheat harvest date impacts both grain yield and quality. Delaying wheat harvest puts the crop at risk for increased disease, lodging, sprouting, and harvest loss. Last year in Clark County, we evaluated wheat harvested on June 29 (at 12% moisture content) and July 8 (at 14% moisture content). Grain moisture increased between June 29 and July 8 due to 0.58” rain between the two dates. A June 27 Update: Wheat is now drying-down and is even being harvested in some parts of the state. Thanks in part to cool spring conditions followed by relatively dry weather during early grain-fill, head scab and other disease levels were generally low in most areas; and low disease severity often means very good grain yield and quality. Stripe rust was our biggest disease problem this year, but outbreaks only occurred in pockets within and across fields.